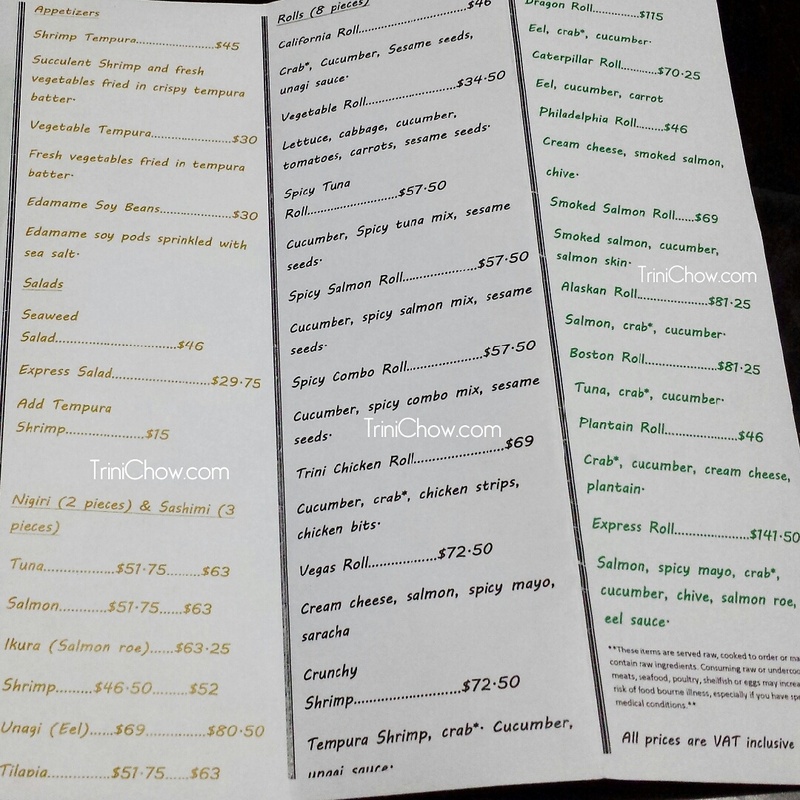 HOME CAFE (St. Clair, Trinidad) – “The cafe at HOME. A new space to create + collaborate. At our flagship in St Clair, Trinidad. A collaboration between ANYA + Abovegroup.” HOME Cafe on Instagram. 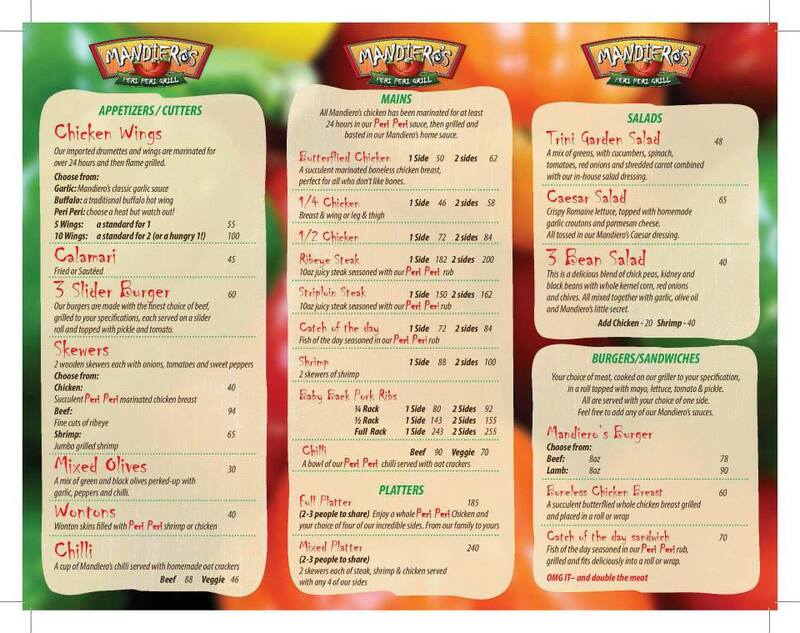 MANDIERO’S PERI PERI (Newtown, Port of Spain, Trinidad) – Opened serving “flame grilled chicken, marinated for two days in original Mandiero’s peri peri sauce and basted during grilling as you like it.” #72 Tragarete Road (corner of Picton Street). 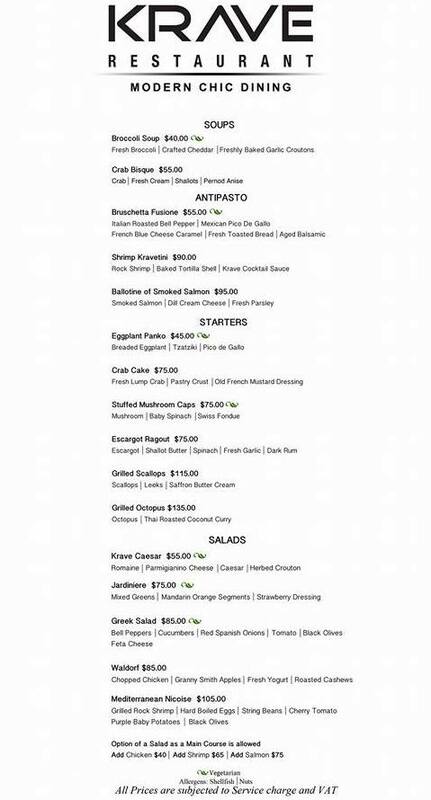 Link to Mandiero’s Peri Peri’s Menu. 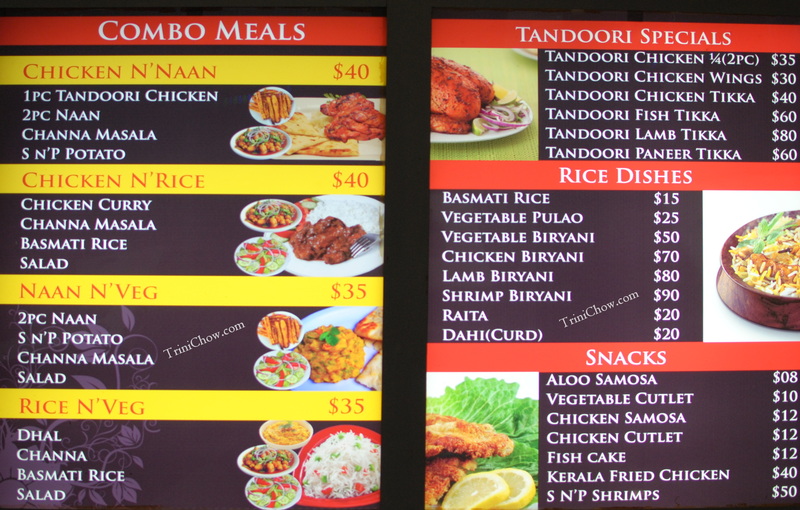 SALT N’ PEPPER (Maraval, Trinidad) serving “classical Indian cuisine” in the Shoppes of Maraval. Current hours 11am-9pm, Monday – Saturday. (868) 622-3938 or 339-4949. Try the Tandoori Chicken and the Chili Gobi. Links to menu 1 of 3, 2 of 3, 3 of 3. 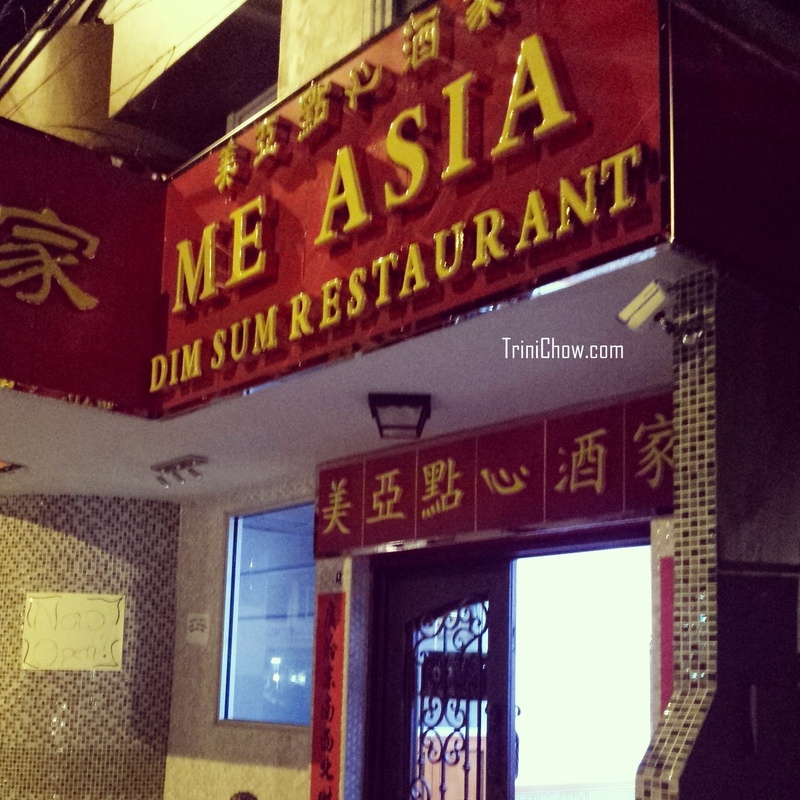 ME ASIA DIM SUM RESTAURANT (Newtown, Port of Spain, Trinidad) – Opened a second location with an all-day dim sum menu as well as an a la carte Chinese menu. Buffet dinner is available on Thursdays 5pm-9pm. The restaurant is located in Hong Kong City’s old space at #86A Tragarete Road. Hours are 11am-10pm, Monday to Sunday including holidays. (868) 622-3949 or 622-6888. 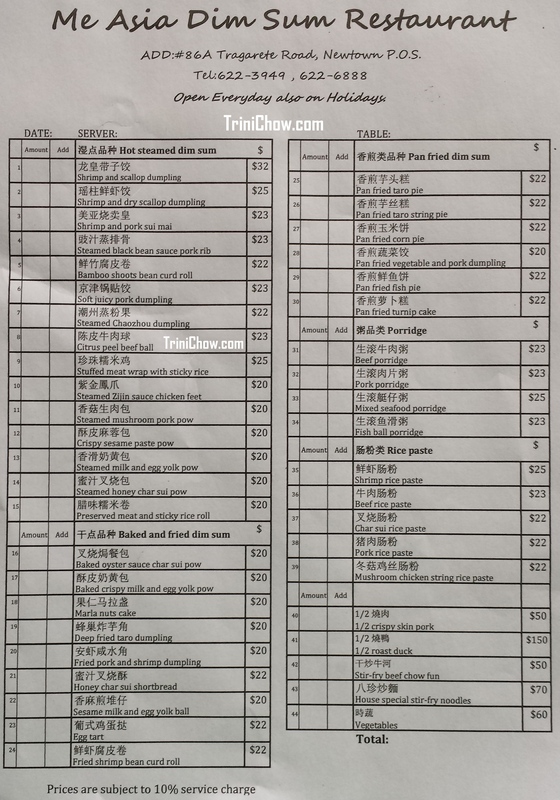 Link to dim sum menu for Me Asia Dim Sum Restaurant. 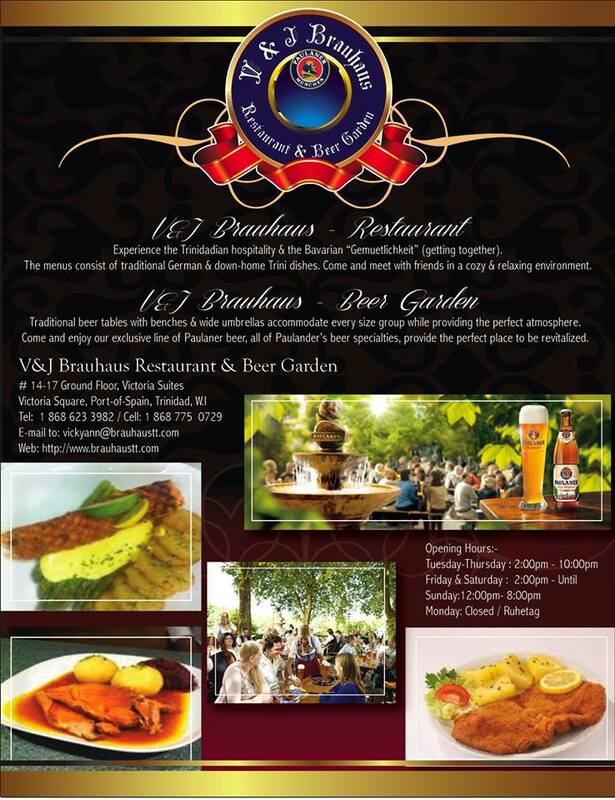 V&J BRAUHAUS RESTAURANT & BEER GARDEN (Port of Spain, Trinidad) reopened in October in its new location at Victoria Square, #14-17 Ground Floor, Victoria Suites. (868) 775 0729. Link to flyer with hours of operation. BOOTLEGGERS (Chaguanas, Trinidad) – Opened on Ramsaran Street in Chaguanas (restaurant in that space was formerly Mojos). (868) 223-2668 or 671-5391. WANDA’S WAFFLES (Santa Cruz, Trinidad) opened at Cruz One Plaza (across from the San Antonio Green Market). Hours are Mon- Thur 8am-8pm, Fri 8am-9pm, Sat 7am-9pm, and Sun 7am-8pm. (868) 354-3333. DAIRY QUEEN (Diego Martin, Trinidad) – Opened at West Bees Plaza in October. MARIO’S PIZZA (Port of Spain) reopened its Cipriani Boulevard store on Monday, 24th November after renovations. FLAIR, THE RESTAURANT (Woodbrook, Trinidad) will be closed for lunch through the end of November 2014. 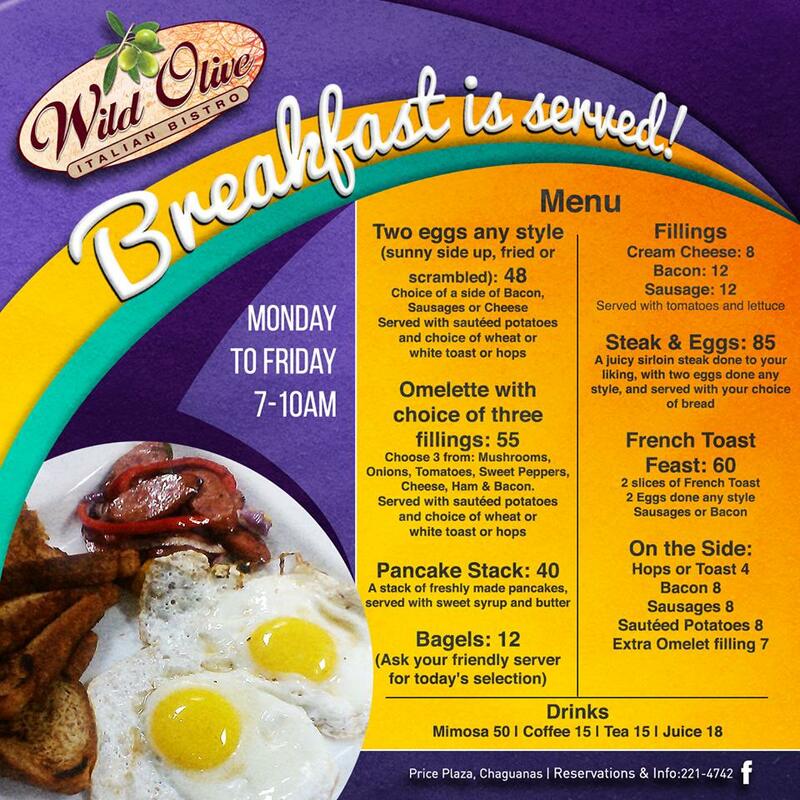 WILD OLIVE ITALIAN BISTRO (Chaguanas, Trinidad) is now offering breakfast, Monday-Friday 7am-10am. (868) 221-4742. Link to Wild Olive’s breakfast menu. 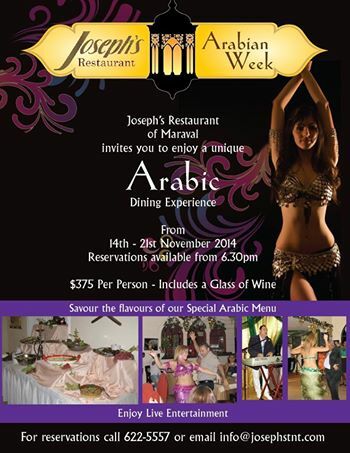 JOSEPH’S RESTAURANT (Maraval, Trinidad) is hosting an Arabian Week dinner buffet special from Friday, 14th November through Friday, 21st November with live entertainment. $375 per person includes a glass of wine. Reservations (868) 622-5557 or info@josephstnt.com. Link to flyer and our post on the week. 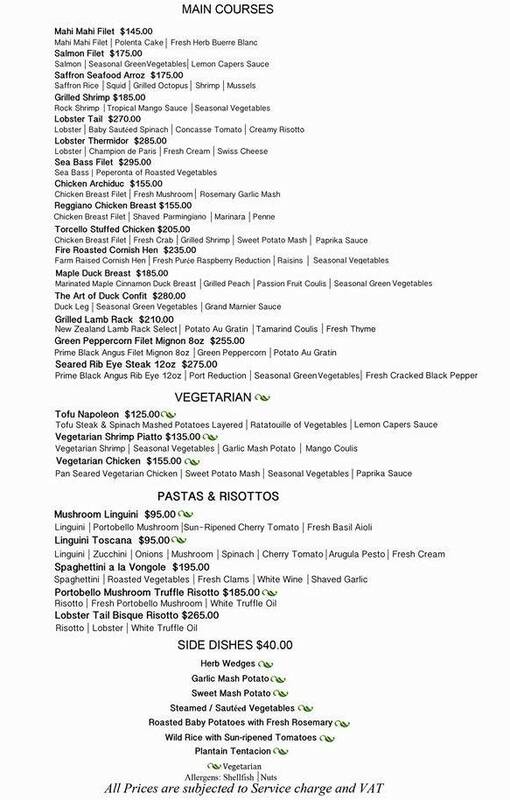 OCEAN (SEAFOOD) DELIGHT has partnered with ANGELO’S ITALIAN RESTAURANT on a promotion where you can win a $800 voucher for Angelos. Link to more details. BLOOM’S IMPORTS – “Bloom’s is happy to announce that we’ve partnered with Tru Valu Supermarket to offer customers a Bloom’s section in Long Circular and Trincity Mall locations! MORE VINO MORE SUSHI rolled out “Tea Time” specials — “Late lunch, mid afternoon snack or some dessert? Come in and enjoy the “Tea Time” specials at More Vino Everyday from 3pm – 6pm. Dine in Only.” Link to flyer. CARNIVAL CITY ULTRA LOUNGE (San Fernando, Trinidad) is now serving a Sunday Brunch Buffet (10am-4pm; $150 per person). 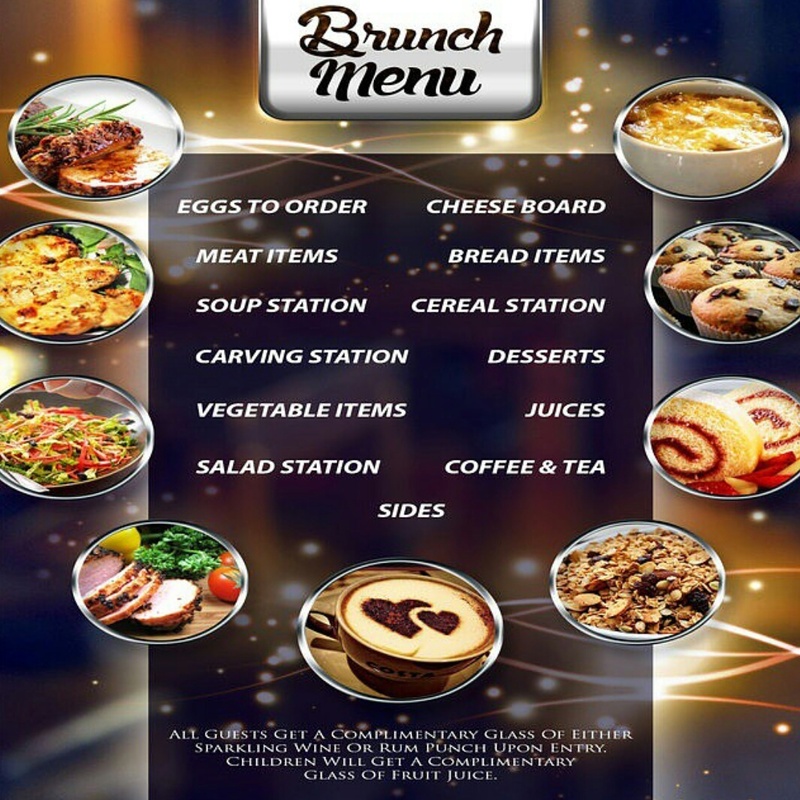 Link to Carnival City’s brunch menu. 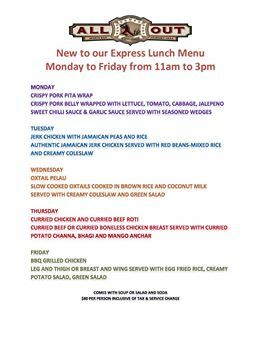 ALL OUT SPORTS BAR & GOURMET GRILL (Port of Spain, Trinidad) added a $80 daily specials to its “Express Lunch Menu” specials include a soup or salad and soda, service & taxes are also included.” Link to All Out’s Express Lunch Menu. 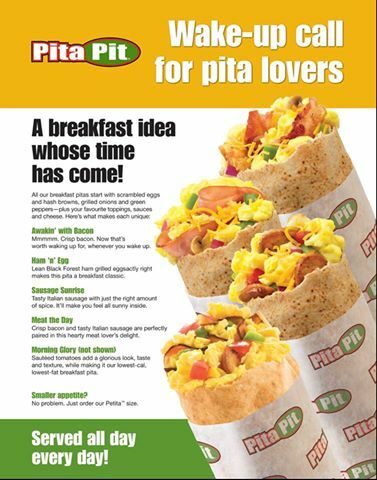 PITA PIT (St. Augustine Trinidad) rolled out an all-day breakfast menu at their UWI location (hours 8am-9pm Monday- Friday and 10am-6pm Saturday). Link to all-day breakfast menu. 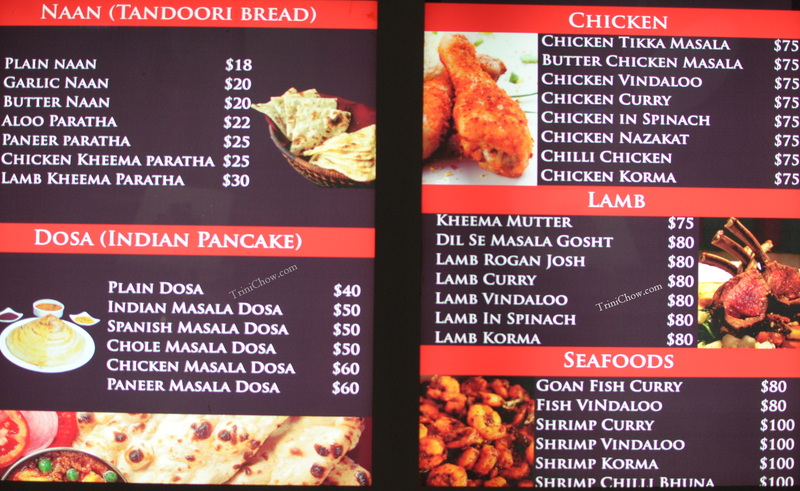 VIAAA (Princes Town, Trinidad) – Now open on Sundays 2pm to 9pm. More details on VIAA (link). PECHE PATISSERIE (Chaguanas, Trinidad) – Peche is opening two restaurants in Chaguanas, both under one roof in late November. It will be located at Oasis Place, #74 Caroni Savannah Road. There will be a Peche Patisserie outlet (Peche baked goods, coffee drinks and select items from POS menu) and ‘Cayenne (House of Spice),’ a new quality fast food venture from Peche. Cayenne will have a similar menu to Pêche PoS, and additional items including burgers, pastas and stuffed naan, as well as combination meals with fish, shrimp, lobster, chicken & lamb. VIAAA GOURMET BAKERY & RESTAURANT (Marabella and Point Fortin, Trinidad) – VIAAA will be opening two new locations in Marabella and Point Fortin in the next few months. COLD STONE CREAMERY (Gulf City, San Fernando, Trinidad) – Coming soon to Gulf City. SNOBIZ (San Fernando, Trinidad) – Opening a second location soon in San Fernando. Al HAAQ BAR B QUE (Piarco, Trinidad) – Opening a new location soon at Piarco International Airport. Hi, can you assist with telephone contact for Denny’s? Hi Zarrina, sorry we don’t have a phone number for Denny’s. Email and mailing address for Denny’s – careers@dennys.tt and PO Box 597, Port of Spain. There seems to be a new bakery close to Long Circular Mall. Can you look into this and provide us with a description? Is it on Patna Street and called Upper Crust Patisserie? 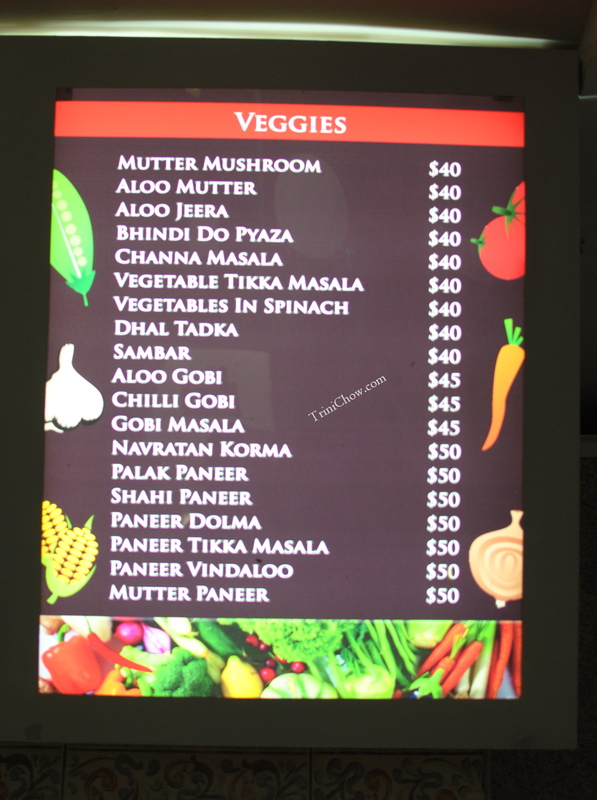 Any new Vegetarian Restaurants ? Hi Jacqueline, sorry no new vegetarian restaurants on this list. (Salt N’ Pepper does have many vegetarian restaurants on its menu.) The vegetarian restaurants that we’re aware of are The Youthful Vegan Cafe & Store in St. James, New Earth Organic Cafe in Woodbrook, Veg Out in St. Augustine, Namaste India Restaurant in Freeport.